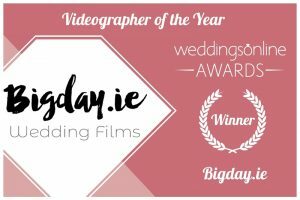 Bigday.ie was founded in 2016 and since then we’ve filmed over 200 weddings and become one of Ireland’s leading wedding videography suppliers. Our brand has one pretty simple value – the client is king. We aim to use our expertise to find out from you what YOU want out of a wedding film, and then deliver it to you in a professional, friendly, fun but discreet way, always putting you at the centre of our minds. We’ve worked with all of Ireland’s best photographers, in all of the most exclusive venues so we understand what is involved to deliver a premium service. As a leading wedding videographer in Dublin, we strive only for perfection! We have 2 lead shooters, Richard and Rory. We can shoot together or separately, meaning that on some dates we can cover 2 weddings. We both use the same equipment and adopt the same filming style which flows into our editing team, which is also Richard and Rory with some additional editors that we can call upon to help out when required. All of our creative highlights films are edited by the person that shot the wedding, meaning that we can guarantee a detailed knowledge of what was unique and personal about your day. Our packages are tailored specifically for each client but we can advise based on our extensive knowledge of venues and photographers, what kind of package is going to suit your wedding.